Not all vehicles are tow-rated or equipped for towing trailers. Consult your owner’s manual for towing capacity and warranty terms. Our community spoke up, and we listened. The Mini Max is more accessible to more towing vehicles at a lower price, while retaining many of the same great features and benefits of it's bigger brother. It may be smaller, but it's a Max in every other sense. The Mini Max is just as resilient as it's bigger brother, and Liberty Outdoors backs it up with a 2 Year Limited Warranty. The exterior of the Mini features 15" premium Kenda tires, Azdel composite sidewall construction, a seamless fiberglass roof, a custom tubular steel chassis, 5 insulated dual pane windows, and a unique 2" rear receiver for additional cargo. The Mini Max delivers maximum toughness for your peace of mind. 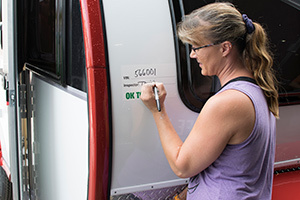 The Mini Max has an interior height of 6', making it very roomy for a teardrop in this class. Most other teardrops this size struggle to get over 5'8" in height. Along with a residential style wetbath, and a dinette that converts to a queen or dual twin bed configuration, the Mini Max makes the most of every inch. 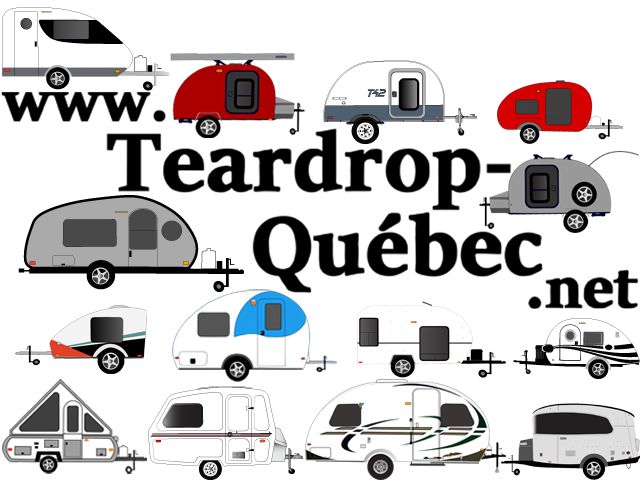 While most teardrops this size offer tiny refrigerators often under 2 cubic feet, the Mini features a huge 5 cubic foot, tall-profile Norcold fridge. Store at least a week's worth of food in the main compartment, with a lower drawer tall enough for a gallon of milk, a 2 liter bottle of soda, or anything else your inner chef can dream up. Use the upper freezer compartment for even more food storage. With the exception of a slightly shorter height, the wetbath in the Mini is exactly the same as the Max. It's 26.5" deep and 41.5" wide. With the same water conserving ITC 3-function sprayer, and the same Dometic pedal flush, marine-style, tall-profile toilet. The Mini's wetbath also features a glass shower door and a floor to ceiling surround, ensuring the water used in the shower stays in the shower. Dinette converts to a full queen or dual twin size bed configuration. With space at premium, the dinette converts into a nifty slide out 75"x70" queen size bed, or a dual 70"x21" twin size bed configuration. The upgraded dinette table is built to marine standards, with a sturdy, hydraulic action pedestal. Simply unclasp the table base and easily push down the table to bed height. For the queen size configuration, pull out the hide-away bed slats from the drawer underneath. Then use the dinette cushions to fill out the bed. In the morning, unclasp the dinette base, and the top rises again to table height with a buttery smooth hydraulic motion. It's the easiest bed conversion you will ever see on a model in this class. You'll say "wow" when you step in to the Mini and experience the natural light streaming in from the rear vertical stargazer window. Enjoy your morning coffee, and read up on the news in style and comfort. Our insulated dual pane windows open up so wide you might forget the windows are even there. Hidden integrated shades and screens let you enjoy the fresh air with added privacy. The 16"x16"x8" sink is unbelievably large compared to other models in this class. The residential style, stainless steel sink allows a camper to conveniently fill up a large coffee carafe, or a larger kitchen pot free of frustration. The built-in, detachable arm sprayer faucet gets more convenient each time you use it. Compare our sink and faucet to other models, and you'll quickly realize there really is no comparison. Experience the Mini Max in 3D. 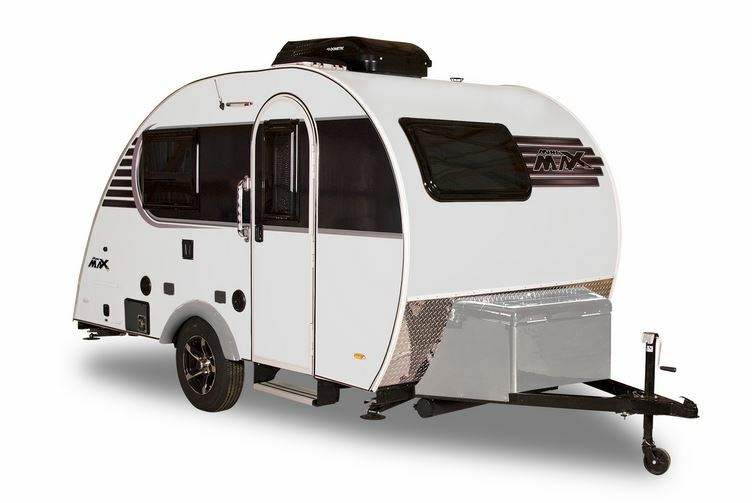 **Source et crédit : Liberty Outdoors is a family of trailer brands consisting of Little Guy Trailers, Serro Scotty Trailers, and ParkLiner Trailers. Liberty Outdoors is headquartered in Uniontown, Ohio. The Little Guy Mini Max is manufactured by American workers in Somerset, PA at a 100k sq. 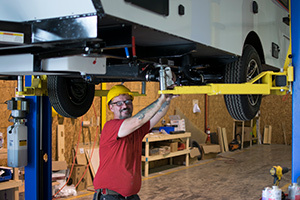 ft. facility employing about 80 people with 20-30 years of RV manufacturing experience. "rusty78609...This Travel Trailer has the off road package which adds about 200 lbs...so dry weight is approx. 2200 lbs. Total length 17'. Can be towed by almost any vehicle."